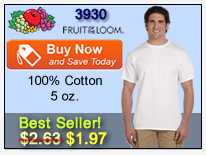 Gildan T-Shirts are one of our most popular brands that we carry. There are many reasons for this. The quality of Gildan T-Shirts is a huge factor. 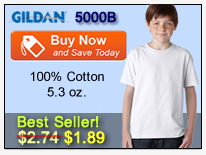 A lot of our customers will try Gildan for the first time and will then become a long term fan of Gildan. Another reason is the large selections of colors not only for Gildan T-shirts but also for Gildan sweatshirts and hoodies. 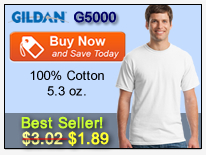 Like most brands, Gildan T-Shirts come in many options of weight and fabric type. For the heavier 6.1 oz option, the Gildan 2000 T-Shirt is available in about 60 colors. The heavyweight 5.3 oz option is the Gildan G5000 T-Shirt which is our best priced T-Shirt and comes in more than 30 color options. Both of these Gildan T-shirts come in youth versions, the 2000B and the 5000B. If you are looking for a 50/50 blend, the G8000 is what you want. Other Gildan T-Shirts we carry include pocket tees and long sleeve T-Shirts. 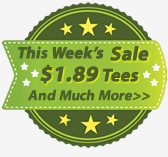 Try Gildan Tee Shirts Today! 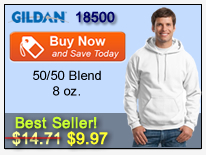 Whatever it is you need, Gildan is a great option for you. If you haven't tried Gildan yet, feel free to order single quantities of any of our Gildan T-Shirts to see what works for you.